Want restaurant-quality braised short ribs and super gourmet demi-glace sauce too? Of course you do. Founder of wellwornfork.com - helping home cooks learn gourmet techniques in the kitchen. 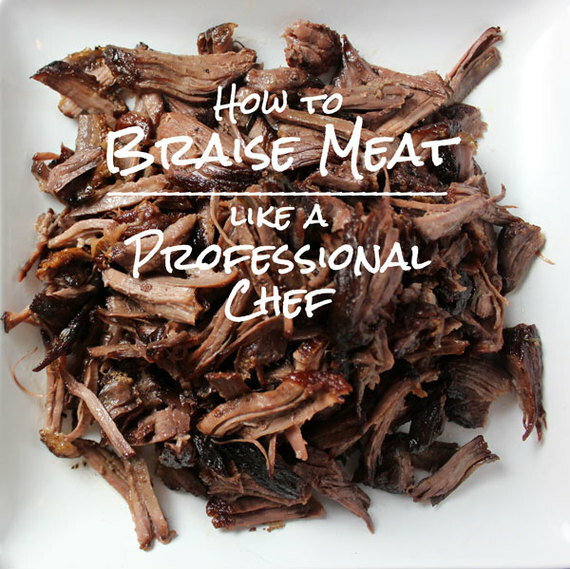 I used to work at a restaurant in Seattle where one of my responsibilities was to get the braise going every morning before the rest of the chefs showed up. All day long, the restaurant filled with heaven-sent meat perfume. UNLIKE braising at the restaurant, I actually get to sit down and enjoy the fruits of my labor when I make it at home. Win! 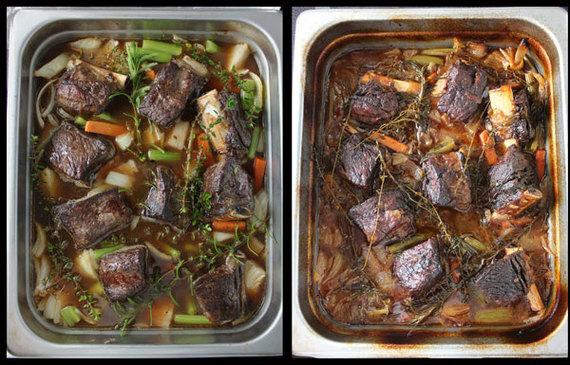 Follow these simple steps and you'll have delicious restaurant-quality braised short ribs and super gourmet demi-glace sauce too! 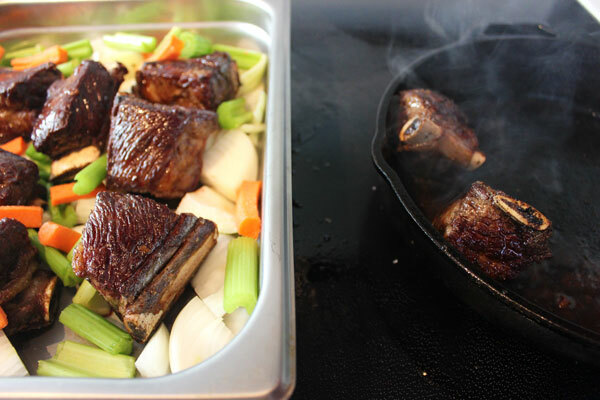 Bonus: short ribs (and most braise-able meats) are very inexpensive! So, let's get started. Number one: Season the ribs with salt and pepper on all sides and heat a cast iron pan with olive oil on high. Number Two: Sear the ribs on each side in your cast iron pan. You want to develop a deep color on the outside without actually cooking it through at all (and obviously not burning it). You do that by making sure your pan is smoking hot, not overcrowded, and uncovered. The sear should look like the picture below. Yes, oil is going to splatter. Yes, you might set off your smoke detector if you don't have a vent above your oven. These are all signs you're doing it right and are totally worth dealing with for the end result! Maybe open the windows and a door or two to prevent that smoke detector mess. You might make your neighbors jealous with the delicious smells pouring out of your home, but that never hurt anybody. Number Four: Check for doneness. 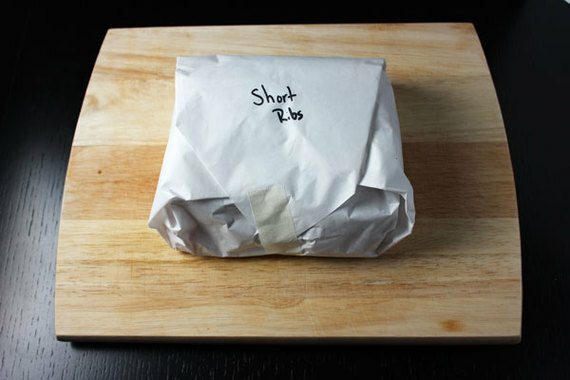 Meat should be fork tender (that means check with a fork, not a knife) and should fall off the bone. If so, pull it out. If not, keep cooking! Number Five: Slide the bones out of the meat and either serve short rib whole (delicious on top of mashed potatoes with demi-glace on top - keep reading!) or shred meat to use however you like. Side note: if you don't have a deep oven-safe pan (like the one above) you can do the whole thing in a dutch oven. The steps would be season meat, then sear in hot oil, remove meat from dutch oven, saute the vegetables in same dutch oven, deglaze with stock, add the meat and herb in, cover with lid and braise on stove-top until tender. While we're here, no good comes to those who waste the liquid gold that has been braising all day long. Strain what's left into a sauce pan and simmer until reduced about 80%. This is called demi-glace. Here's another pro-tip! To make a smooth, silky sauce, you want to skim as much fat out of it as possible. Fat makes sauce greasy and gross. We don't want that. Now, boiling the sauce to cook it down will incorporate the fat into the stock (thumbs down), but simmering the sauce will bring the fat to the surface where you can easily skim and discard with a spoon (two thumbs way way up!). Sit down and enjoy a big plate of all your hard work. It'd be a shame not to! 2. Heat a large saute pan or cast iron pan to high heat with some olive oil to coat. 3. 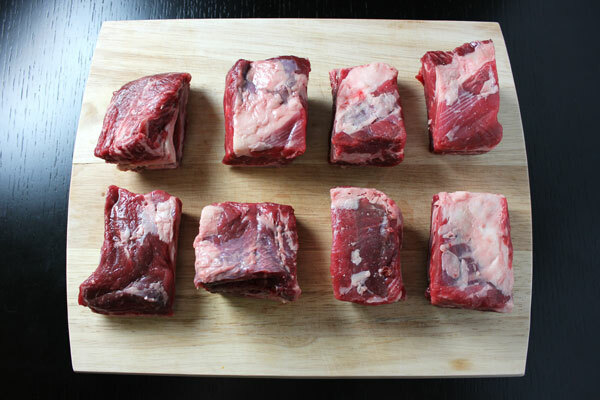 Season all sides of the short ribs with salt & pepper. 4. Sear each side of the rib in the pan until deep color develops. 5. Set aside in a deep oven-safe pan. Add all other ingredients. The stock should cover about two thirds of the ribs. 6. Cover with tin foil and place in the oven to braise for 5 hours. Check that meat is fork tender and falls off the bone. If so, it's done. If not, keep cooking. 7. Pull bone out of the meat and strain the stock into a sauce pan. Simmer until sauce reduces by 80%. This is demi-glace and it's delicious. **Can also use a dutch oven to sear and braise on top of the stove top. Oven is not needed with this method.